Several Indian drug makers seem ripe for the picking, but buyers will have to come up with compelling offers. The Singhs of Ranbaxy are hardly the first business family to sell out. For example, the Sekhsarias of Gujarat Ambuja gave up control to Holcim, and even in pharma, N. Prasad, who founded Matrix Laboratories, cashed out in a 2006 sale to Mylan Laboratories. “I am a great believer in the view that wealth has to be unlocked or else it remains only on paper,” says Prasad. Is the time right for Indian promoters of pharma companies to cash out? It does seem so. Over the last two decades, quite a few of them have become global players in their own right, with impressive capabilities in manufacture of low-cost generic drugs and even discovery of new molecules. In contrast, Big Pharma has been on a decline since the start of this decade. Reasons: Soaring R&D costs and fewer blockbuster drugs. The top 15 companies in the industry have lost $850 billion in market value between 2000 and 2008. Big Pharma needs a wonder drug to battle its blues. Awaiting one, it is building presence in generics. Novartis was the first innovator company to spin off (in 2003) its generics business into Sandoz and to grow it consistently ever since. Here’s the interesting thing, though: As Big Pharma brings its crushing heft—everywhere from the marketplace to court rooms—to the battle, the smaller rivals are realising that the going ahead will only get more bruising. “Consolidation is taking place globally and this (Ranbaxy-Daiichi-like deal) is no more a choice but a compulsion,” says Prasad. That leads to the question, after Ranbaxy who? Promoters are swearing that they are not selling out yet. “It’s not on the cards,” says G. V. Prasad, Vice Chairman and CEO of Dr Reddy’s, “the two cases (Ranbaxy and Dr Reddy’s) cannot be compared”, but the pressure to take the bait is intense. Indian drug makers that are vertically integrated—that is, they manufacture everything from bulk drugs to finished dosages with R&D thrown in between—are attractive targets. Yusuf Hamied, Chairman of Cipla, warns against such deals. “This deal, right or wrong, should be a wake-up call for the government on various matters concering the Indian pharma industry,” Hamied told BT from Spain. His point: the death of Indian generics players will mean the end of cheap drugs. “India must review its law in relation to intellectual property and there must be a pragmatic compulsory licence system for medicines so that they remain affordable,” says Hamied, promising that his family won’t sell out “at least in his lifetime”. Evidently, Indian promoters are emotionally attached to their companies and their causes. But Malvinder Singh has proved that there’s a point at which logic overtakes emotion. Ranbaxy has reached that point. 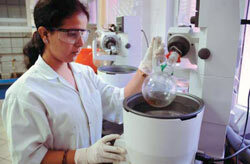 Other Indian drug makers may too in the years ahead. What's the road ahead for Indian BPOs?